“In 1895 there was an eclipse of the moon and supposedly in Turkey, some people thought that by shooting at the ‘beast’ on the moon they could somehow rid it of the shadow,” says Richard Kalinoski, explaining the title of his play. For him, that vividly represented how the Turks turned on ‘the other’ – the Armenian minority in their midst – as a scapegoat for their ills. It’s a persecution that led eventually to the Armenian massacres of 1915, which its victims are still seeking to have formally recognised as a genocide. Kalinoski says his Jewish friends and supporters have commented about how his play “evokes their own shared cultural memories; that this very specific experience manages to find a measure of universality located in the hopeful story of a marriage”. Beast on the Moon, set in 1920s Wisconsin, tells the story of 15-year-old Seta, who’s been orphaned by these terrible events, and 26-year-old Aram, now an American citizen after escaping the killing that wiped out the rest of his family. Aram is making his way as a portrait photographer in Milwaukee, by the time he plucks Seta out of a Turkish orphanage to be his mail-order bride. She’s barely more than a child, yet Kalinoski succeeds in telling a ‘hopeful’ story, not least because of his creation of the little life force that is Seta. In some ways it’s like watching the Taming of the Shrew in reverse, as the almost irrepressible Seta and the hidebound repressed Aram edge towards each other. The play opens with the arrival of an excited, apprehensive Seta in the room that serves as living space and photographer’s studio. Spanning eight years from 1921 to 1933, it follows the ups and downs of a marriage that is often tense and uneasy, gradually developing into perhaps more than a working relationship. In her sensitive production for All Ignite Theatre, director Jelena Budimir is blessed with an extraordinary pair of lead actors. George Jovanic perfectly captures Aram’s awkwardness around Seta, and how it leads to exasperation as he tries to put into practice his expectations from his marriage to his young purchase, both physically and emotionally. It’s a tribute to his sensitive portrayal and to the writing that he does not lose audience sympathy, despite his clumsy attempts to consummate his marriage and make Seta into the wife he ordered by quoting Bible texts that reinforce his idea of the perfect compliant wife and, he hopes, mother. Fortunately, Zarima McDermott’s luminous, resourceful Seta is more than a match for him and not just in parrying those quotes. The terrible events she has survived and the situation she finds herself in means she’s had to grow up quickly, but that she is still almost a child is touchingly betrayed by the rag doll she’s brought with her. In a telling moment Aram forbids her to hold the doll when he takes her portrait: “We are legally married. Put the doll away. You act like a child,” he orders. “It’s how I feel,” she says honestly. “Stop feeling like a child,” he retorts. It’s her brave and successful attempt to share companionship with him, to fit into his life and the life of the little American town beyond their front door (nicely suggested by accounts of the general store and its owners) that makes the story ultimately hopeful. That life is also personified by the arrival of young Vincent, an abused Italian American ragamuffin from the local orphanage who becomes part of their lives, fulfilling their hopes of raising a new generation of American citizens in an unexpected way. Here this child is played by an adult actor and Hayward B Morse attractively pulls off the double of also interacting with the audience as a narrator, the adult ‘Gentleman’, recounting the couple’s story years later. It’s a story that has obvious and urgent resonances for today, for acceptance of refugees and understanding what they have suffered, for issues of integration. Here it is brought to life by fine storytelling and full-blooded characters, beautifully framed by Sarah Jane Booth’s warmly coloured screens embracing the action, sepia tinted like old photographs or the colour of the rocky sandscape of Armenia. A special mention too for Booth’s vivid costumes for Seta, beginning with the formal frock she wears when first we meet her, its golden-brown stripes echoing those sepia tints. 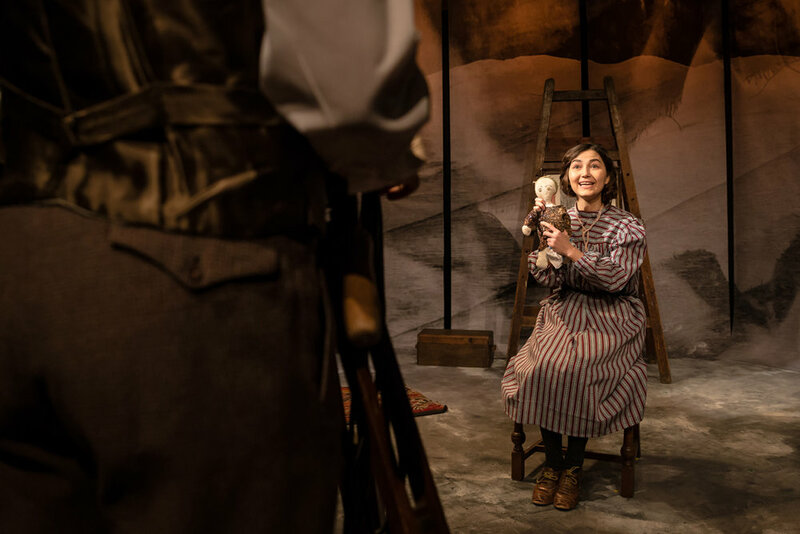 Matt Cater’s atmospheric lighting and Joe Dines’ sometimes ominous soundscape, suggesting past horrors, play their part in intensifying the experience in the Finborough’s intimate space. From this illuminating production, it’s not surprising that this moving, sometimes heartbreaking, sometimes even funny play has been translated into many different languages and constantly revived worldwide since Kalinoski wrote it more than 20 years ago. Listen to our interview with playwright Richard Kalinoski on JR OutLoud.